Reduce the number of mosquitoes around your home and neighbourhood by reducing the amount of standing water available for the mosquitoes. 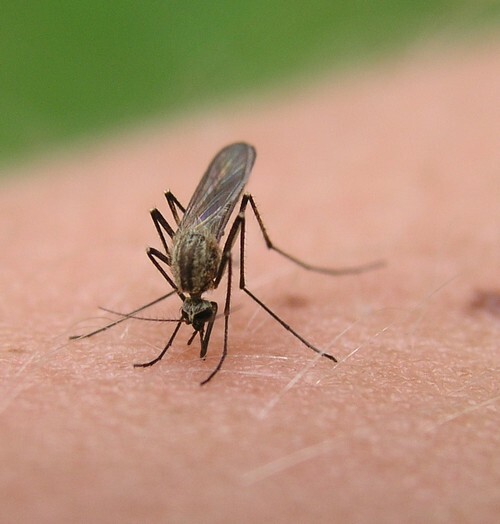 Avoid mosquito bites – Wear long pants and long sleeve shirts. Tuck the pant into your socks. Tuck all shirts in completely. Avoid mosquito bites - Cover the head with a hat or cap. Wear ear covers. Dark Clothing – Always wear dark coloured clothing. Thick material that the mosquito cannot bite through is recommended. Protect your children – Apply an insect repellent regularly on all exposed skin. Use a repellent with the lowest possible chemical concentrate. Pay special attention to discarded tires that may have accumulated on your property. The used tire is the most common domestic mosquito breeding location in this country. Clean clogged rain roof gutters on a regular basis, particularly if leaves from the surrounding trees have a tendency to plug up the down drains. Roof gutters are easily overlooked but can produce millions of mosquitoes each season. Turn over wheelbarrows and do not allow water to stagnate in birdbaths. Both provide breeding habitat for mosquitoes. Do not leave plastic garbage containers open; they will collect rain water and become a breeding area for mosquitoes. Aerate ornamental pools or stock them with fish. Water gardens are fashionable but become major mosquito producers if they are allowed to stagnate. Clean and chlorinate swimming pools that are not being used. A swimming pool that is left unattended by a family that goes on vacation for a month can produce enough mosquitoes to result in neighbourhood-wide complaints. Be aware that swimming pool covers do not eliminate the breeding problem as mosquitoes will find their way in and out. Use landscaping to eliminate standing water that collects on your property. Mosquitoes will breed in any puddle that exists for more than four days. Anyone bitten by an infected mosquito is at risk for the West Nile Virus. Although the risk of severe infection is at the moment greater for people who are age 50 or older, or those who have weakened immune systems. It is important to see a Doctor as soon as possible if symptoms of West Nile Virus Encephalitis appear. There is no specific treatment for West Nile Encephalitis and no protection vaccine has been found.